The life of an elephant in modern Thailand can be difficult. Too many are employed in practices negative to their welfare, such as performing circus-style tricks, walking on roads, working in heavy industry or exploited at popular beach locations. 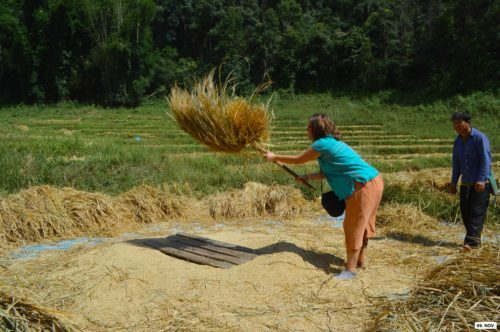 At Chiangmai Elephant Land we aim to provide a better life for our elephants by giving them unspoilt land on which to roam, rich forests to enjoy, beautiful waterfalls and rivers in which to bathe and relax, and provision of organic, natural foods. 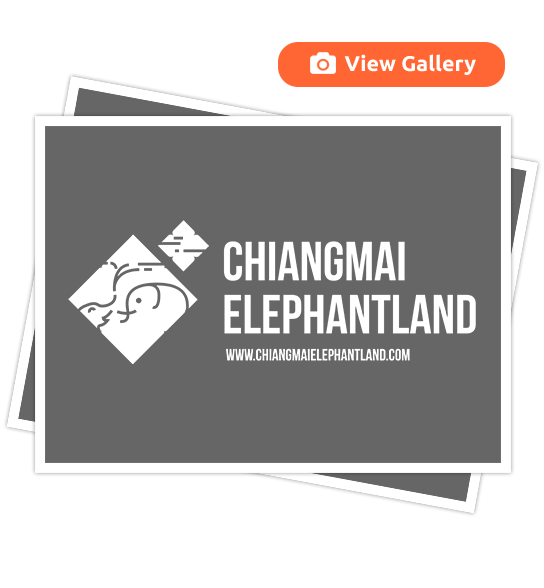 Chiangmai Elephant Land promotes sustainable, ethical, eco-friendly tourism and ensures your elephant experience does no harm to the animals or to the environment. From feeding to washing and bathing, hugging and holding, we offer you a unique opportunity to care for these amazing creatures. 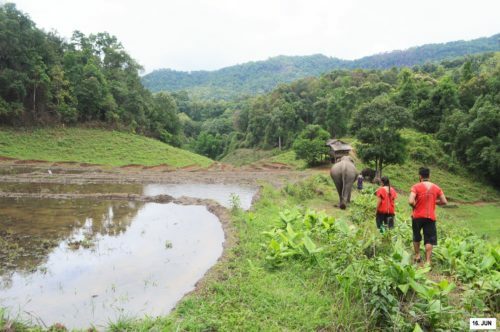 Elephant Land â€“ a special place for elephants and humans. My husband and I went to Elephant Land yesterday (March 6, 2019) and it was absolutely incredible! Before our trip we did extensive research as to which elephant sanctuary to participate in. 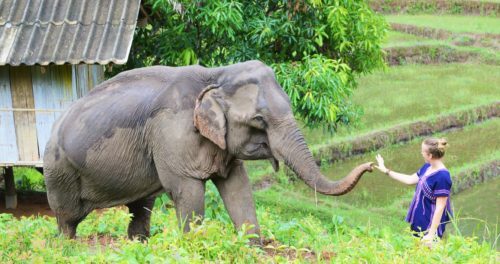 For us, we wanted to make sure it was a true sanctuary where the elephants were well looked after and not one of those “sanctuaries” elephants are forced to perform shows and give rides to tourists. You could tell these were very well looked after elephants. 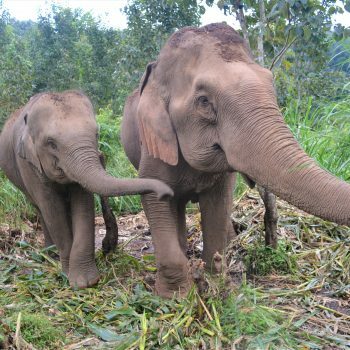 The elephants at Elephant Sanctuary are not owned by one person but rather by the whole Karen Tribe in this this small community north of Chiang Mai! (Approx. 300 people). Our guide was Super Boy and he was amazing! 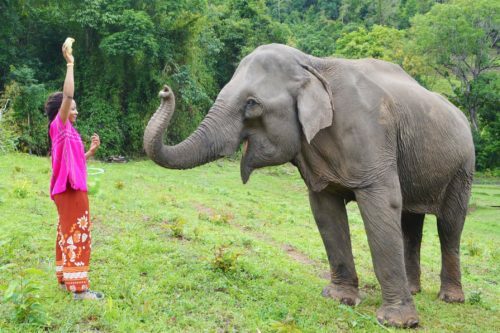 Very knowledgeable, was always available to answer our questions and shared more information than we expected about how they acquired the elephants, how they care for the elephants and even how the sanctuary came to be a community business. We were picked up at 8:30am and only had 11 people in our group. Elephant Sanctuary only hosts 1 group per day so you move at the elephants pace. There are 5 female elephants and one baby elephant on the way. The elephants range in age from 4-45 years old. There are two grandma elephants, a momma and baby elephant and a teen elephant who is pregnant and due to give birth in 1yr. The day started with feeding the elephants bananas from the jungle, then we went for a walk through the jungle with 4 of the elephants (1 elephant didn’t want to go so this elephant was not forced to participate). After about 2hrs in the jungle, we went back for a delicious pad Thai lunch prepared by some of the Karen women. We then took the elephants for a mud bath and wrapped up with heading to the waterfall to wash off both ourselves and the elephants. It was a feel good day all around! Definitely a highlight of the trip! We HIGHLY recommend Elephant Land!!! My boyfriend and me stayed at the elephantland for the night experiencing the elephant as well as the jungle trip. 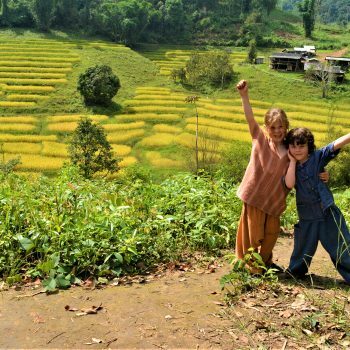 Both trips were amazing and we learned everything we wanted to know about elephants and the lifestyle of the mahouts and their families. 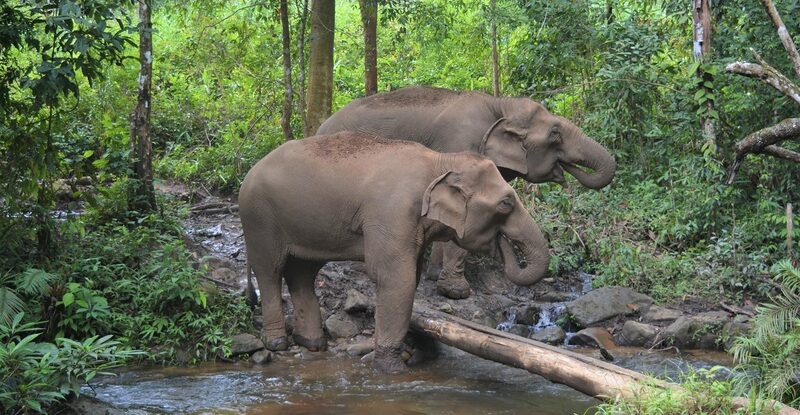 The elephants are treated really well and can sleep in the real jungle during the night. The guides were very enthusiastic and taught us a lot about the flora and animals of the jungle. We saw a snake, many huge spiders and a tree nest full of ants. During the jungle trip we walked through the deep jungle climbing some trees and small rocks. I can highly recommend both trips. 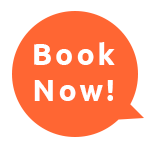 The jungle trip is amazing for people who would like to know more about the nature and the fruits and vitamins it offers. I wanted to be sure that I would go to a real elephant sanctuary so I spent a night doing some research on at least 15 different places. I ended up choosing Elephant Land and I\'m more than satisfied with my choice. My guide was Boy and he was amazing, full of energy and he would answer all our questions. Also the rest of the staff was very nice and you could easily see that they do care for the elephants. I had a great time!! My 18 year old daughter and I did the 1 day tour. Our tour leader was Boy. He was excellent. Informative, funny, helpful. He made the experience great. The 2 hour ride there and back is bumpy at times but the views are worth the drive. One of our best days in Thailand. 3 elephants, two were off mating. Very ethical. Feeding and a jungle walk with the elephants as they forage. Gentle giants with lots of up close and personal time. Pictures taken for free, excellent lunch. Great company to give back to as they truly care about the well being of these animAls and providing the best natural environment for them. Highly recommend this tour over others. Fuimos un grupo de 6 personas de vacaciones a Tailandia y, sin duda, el día que pasamos en Elephant Land ha sido el mejor. 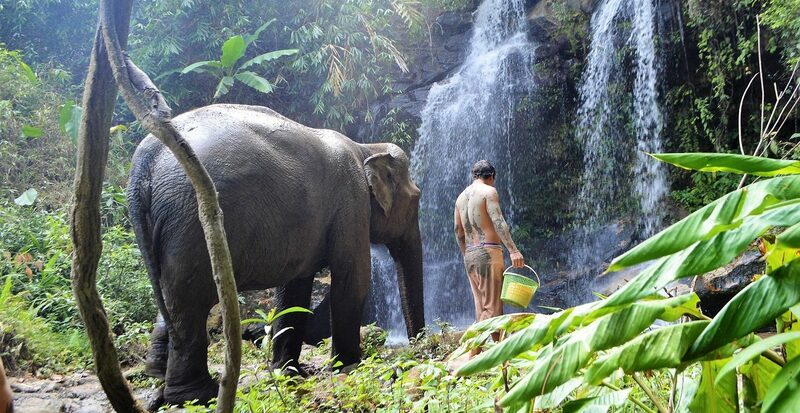 Todo fue especial, desde el viaje en tuc - tuc al principio, en ranchera después hasta la reserva, llegar allí, conocer a su gente y a los elefantes, darles de comer, tocarles, hacer una ruta con ellos, llegar a la cascada, bañarnos con ellos, .... no hay palabras para describir la magia de ese día. Recomendable para todo el mundo, un lugar y unas gentes que tratan con inmenso cariño a los elefantes, que te hacen disfrutar de cada momento, ... y con los que finalmente compartes una exquisita comida tradicional. Un dia maravilloso, en el que compartimos experiencias, muchísimas risas y, sobre todo, en el que nos acercamos a una realidad preciosa e incontable en palabras. 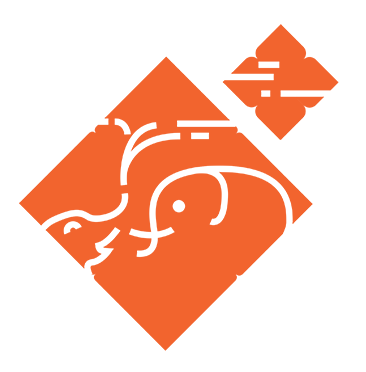 Gracias a todos, en especial al equipo por su excelente trato y por darnos la oportunidad de vivir algo tan bonito.